Zhucheng Rundong Machinery Co., ltd, a professional manufacturer that focuses on food machinery development, design, production sales and service. The plant base in the biggest food machine base Zhucheng city, it is about 70 KM to Qingdao port. The corporation passed ISO9001: 2008 quality management system certification, we specialized in varis kinds of vacuum packaging equipment, including large comercial use automatic continuous box/strech film vacuum packaging machine DLZ320/420/520 household small sized vacuum packing machine DZ400/500/600/700/800 and pneumatic continual vacuum machine. Strong technical force, Strict quality management. Got product number of national patents, with world advanced level quality. established stable long-term strategic partnership with customers. 1. 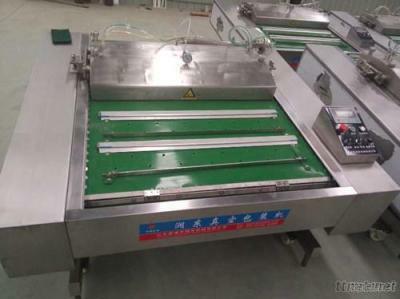 This automatic vacuum packing machine can automatically complete the ordered processes of vacuum extraction and air inflation, filling, sealing etc. 2. The vacuum packed products by food vacuum machine can be kept fresh in a long time by preventing oxidation, mildew, moth, damp. So this machine can extends the product storage period. 4. If you need nitrogen or any gas sealing for bag by vacuum packing machine, we customize this machine as request. 1. Application object: food, tea, bean, rice, cosmetics, snack, electirc products, grains, and other small products. 4. Simple working principle, easy to operate. 5. Widely usage of vacuum packing machine.